In case you haven’t caught on yet, CVS is my favorite store to shop in. I love the thrill of checking out and seeing a total due of $1.25 for $50+ in products! I’ve been “CVSing” (it’s a verb) for almost 9 years now, so what seems second nature to me might be a bit over whelming for others. To make it super simple, here’s 7 ways that you can up your CVS game and save even more money! Start online. 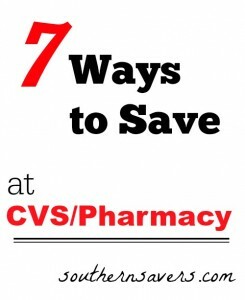 Grab your CVS card and head to CVS.com to create a My CVS account. Register your card there and sign up for their weekly emails. Every Thursday you’ll get an email with a printable coupon to help you save on your next trip. They are normally always general purchase coupons (meaning they aren’t for specific products) like 25% off or $3 off any $15 purchase. Tip: Wait and print out your coupon from the weekly email on Saturday or Sunday and your CVS store coupon will not expire until the middle of the next week! Now you can use it on this weeks deals, or next weeks. Visit the Coupon Center first in the store. This is the big read machine right inside the door of most stores. Scan your CVS card or enter your phone number and coupons will print out the side of the machine. Most of these are good for two weeks, so if you don’t use them today hold on to them for next week. These are all store coupons and can be used with manufacturer coupons to save more. 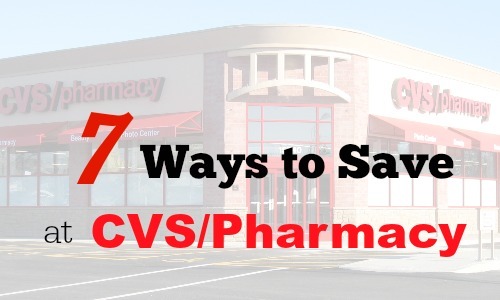 Tip: If the coupon center gives you next to nothing, it may be time to get a new cvs card. Sometimes starting over as a “new” shopper brings on tons of coupons as they try to convince you to be loyal. Know the Coupon Policy. CVS accepts a number of coupons at the register. Remember the best part of CVS is that deals are always based on the before coupon purchase. If you need to by $30 in baby care items to get a $10 ExtraCare Buck, that means you buy $30 in product and then start handing over all the coupons! You can also use SavingStar, Ibotta, Checkout 51, Snap by Groupon and a number of other apps. They do not come off at the register but are additional savings like rebates after your purchase. Live by the 97% Rule. This is a special secret among CVSers, never feel the need to buy 4 packs of diapers at $9.99 a pack so that you’ve hit the $30 needed for a deal. If the deal requires buying a certain value, as long as you are within 97% of the requirement your ExtraCare Buck will print! This will save you a ton by not over buying on deals. Again, let me emphasize that the purchase requirement is before coupons. Roll Your Rewards. You can always pay with ExtraCare Bucks from previous transactions/trips towards deals that are going to print more rewards. If you have $15 in ECB saved up and you pay for the entire amount due with them, you’ll still get however many rewards you should have with your purchase!! This is how you will get totals to be super low. Really this is your way to pay with CVS currency instead of real money! Saturday Night Is Magical. If you have a CVS that is not a 24 hour store, then you have a special overlapping window to shop in. On Saturday evenings, by 6 pm until they close, stores that close at night turn on the Sunday sales early. They also still have all the Saturday deals running! This means you can shop two ads at the same time and save yourself a trip. Tip: When you go shopping on Saturday night one of the ads will not be marked. They will be in the process of changing all the tags to Sunday’s sales, but you’re not going to be to see both sale ads on the shelf. Make sure to take your lists from Southern Savers for both ads and just trust me on one of them as you shop. Never Forget Rain Checks. CVS rain checks never expire plus they print the ExtraCare Buck, that should print this week, whenever you use them!! If you head in and a great deal is gone in your store, ask the cashier for a rain check. You can use this at any time, in any store, to get the deal later. This makes shopping in CVS a lot less frustrating since great deals can go very fast. If planned on using coupons with the deal, you cannot use expired coupons. However you can always hold onto your rain check until you have more coupons.